These circlets are worn on the pad of epaulettes by line officers of artillery, infantry or cavalry. The background color is that of the branch of service. The number is in gold and the borders are of silver embroidery. These were worn on epaulettes to indicate the regiment and branch of service. These circlets were pinned to the surface of the epaulettes. Higher numbers, such as the 25th regiment, are for state forces and lower numbers could be Regular Army or state forces. Circlets are of two types:1) flat (such as those above) and 2) domed. Notice that the blue of the circlet with the number four is a deeper blue than the other. 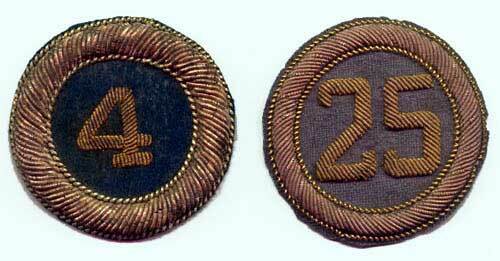 This kind of color variation is common with Civil War insignia.